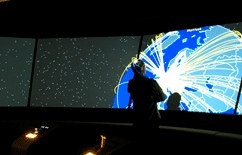 In 2009 I build the software and sound design for a real time interactive full dome video projection showing flight movements of Lufthansa / Star Alliance flights. The installation has been created by WhiteVoid for Lufthansa and is permanently installed at their training center near Frankfurt. 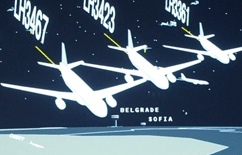 A joystick allows players to navigate themselves from outer space down to earth and fly around the globe, whilst observing all flights of the Star Alliance fleet. The position and movement of the planes is an exact model of the real situation, based on the current flight data received from Lufthansa. 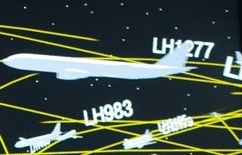 The player can speed up the movement, freeze it, or tell the simulation to display all or a selection of the fleet as lines connecting source and destination airports. In all cases the player can move their point of view freely around and observe the situation from any point in space. 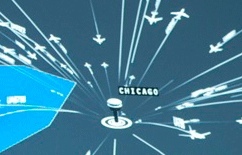 The audio engine receives a continuos stream of position data from the video rendering server: a list of the closest visible airports, a list of the closest visible spaceships, distance between virtual camera perspective and earth surface, time lapse factor and other data that relates to what is displayed and how. The audio engine, realized in MaxMSP uses that data to generate various sonic events; a background atmosphere that provides an overall sense of positive expectation, another darker background atmosphere that is more complex and is a function of distance to earth, thus most prominent if the visitor navigates far out in space as well as various short signal sounds for audible feedback if user presses function buttons to change details of the simulation such as time lapse factor or number of displayed airlines. And, most important, a stream of endless airport tower communications, and the sound of the spaceships passing by. 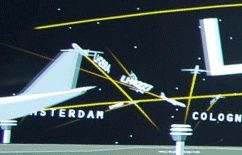 The tower sounds, associated with the closest airports are created by randomly re ordering short slices of recordings from airport communications, where the density of those snippets is also a function of distance; if the tower is far away the stream is almost continuos but quiet, providing a sense of constant distant activity. the closer the player gets to the airport, the longer the moments of silence become, resembling more a realistic situation. The simulation of the jet engine sounds is based on filtered noise, a compromise between a realistic experience that would become very annoying when rendering the sound of dozens of planes passing by close, and a more abstract approach that resembles more of a soft flow of air, thus creating a desired sense of lightness and high tech. All sounds are distributed in space via a six channel ring of speakers, where the sonic position of the sources matches the visual position of the planes and airports. The panning is done using ambisonics plus distance filtering and doppler effect. The effect of atmospheric turbulence that is highly audible on distant yet sounds is also modeled via a chorus / comb-filter combination. For technical reasons the audio engine has to run on a single Mac Mini, which made it necessary to strip down the MAX patch to the absolute minimum. It only calculates sound for the five nearest plane and towers, and the filtering for the plane engine noise source is not very sophisticated. But the principle could easily be scaled to calculate much more towers and much more planes with a more complex jet engine model. Also modeling sound reflections between atmospherical layers and clouds could improve the realism. However, the current version already provides a quite impressive sonic experience due to the tight interaction between visual and audible events in a multichannel environment. The installation runs since 2009 without interruption.